LED power supplies have been significantly updated and the LED HLG-Series are the latest generation of outdoor rated high performance LED power supplies. 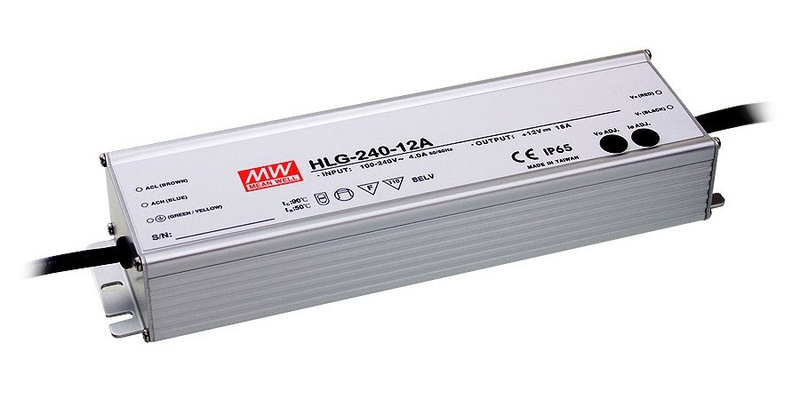 HLG-240H are high output, efficient, waterproof LED power supplies with a built-in, active PFC function. The HLG-240”H” Series has a wide AC input range (90~305VAC) allowing for operation in 277 Volt circuits for lighting in industrial and commercial 277/480 Volt systems in North America. The "A" type of model HLG-240H, with adjustable voltage and current, can be used to provide power in many thermoelectric applications such as cooling/warming outdoor enclosures. To operate reliably in harsh outdoor environments, each unit is fully potted by heat-dissipating glue, within an aluminum case closed with stainless screws. The units are intended for exposure to the elements and have IP 65 or IP67 waterproof/ dustproof rating (see data sheets for various configurations). The waterproof versions have input/output cables but a terminal block version (Type C) is also available for indoor use. With state-of-the-art LLC topology and synchronous rectifier technology the HLG-240 (H) series are remarkably efficient (up to 94%) so can be cooled by natural (free air) convection. They have a very wide ambient temperature operating range of -30 ºC to +70 ºC meeting the requirements of almost all outdoor installations. Standard functions include protection for short circuit, over voltage, overload, and over temperature. All versions meet the harmonic current limitation per EN61000-3-2 Class C. HLG-240(H) also has a PF>0.9 if loading over 65%. In addition, both versions have 4KV surge immunity (EN61000-4-5) which complies with the requirements for street lighting. Users can adjust DC output voltage range from 95 to 105% and current range from 50 to 100%. This flexibility is wonderful for LED lighting system designers and managers when they want to make some slight adjustment to output voltage and/or current to moderate the light from the LEDs. The HLG-240 (H) series is also available in 20 Volt, 30 Volt, 42 Volt and 54 Volt versions. Contact us for price and lead-time for these. The basic or “Blank Type” are IP67 rated and has all the basic features without an ability to make voltage and current adjustments. HLG240-H Series have global certificates for UL / CUL / TUV / CE and comply with UL1012, EN61347-1, EN61347-2-13 lighting regulations as well as IT regulations UL60950, EN60950-1. Meeting these requirements assures your application will meet global safety and EMC regulations. These high efficiency power supplies are very suitable for LED street lighting, LED high-bay lighting, outdoor electronic display, LED decorative lighting, indoor/outdoor LED lighting…etc. They are also a good solution for general applications in outdoor environments with high dust and/or moisture, such as outdoor mechanical or electrical equipment and telecommunication base stations. "A Type" HLG-240H supplies can be used as the power supply for many thermoelectric applications.